‘Fox Trap’ slasher movie introduction from the editor. Over the last month I have been editing the feature-length slasher movie ‘FoxTrap’ from Proportion Productions and directed by Jamie Weston. I haven’t always had the pleasure of cutting other people’s films and it was an exciting opportunity to cut my first feature. I think I have an equal love for writing and editing with my passion for storytelling. This is why I love directing. I love carving stories. This is exactly the opportunity I’ve had with ‘Fox Trap’. Although I am by now means done, we currently have a first cut clocking in a little longer than myself and the producers would have liked, there is still plenty of work to do. I suppose the phrase writing is re-writing can be applied here: editing is re-editing. I really want to talk about workflow and processes for cutting a low-budget feature and I hope to write an article detailing my experience and method using Final Cut Pro X soon. I also plan to release a few new tutorials based on cool new features and techniques I have learned over the duration of this edit. 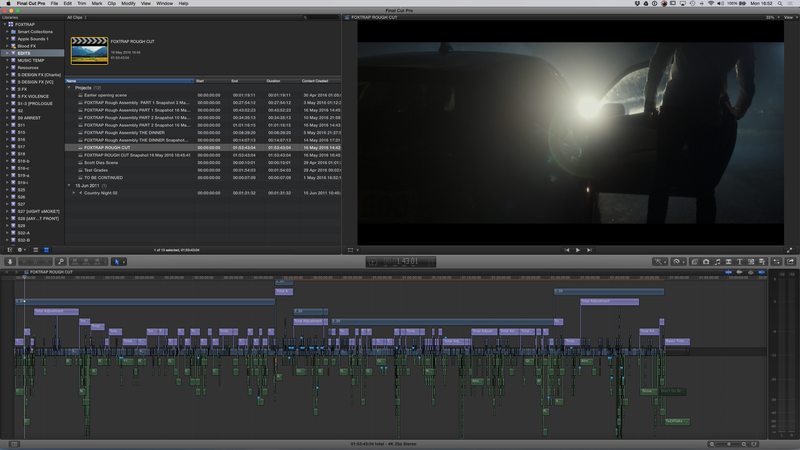 This film has some really great moments and I’m really proud of how its shaping up. It has a genuine filmic and independent quality to it and I can’t wait to share more.